Lemon and ginger are both detoxifying for the body, and are popular ingredients for many famous cleanses. This version is easy to make and just as good for you! 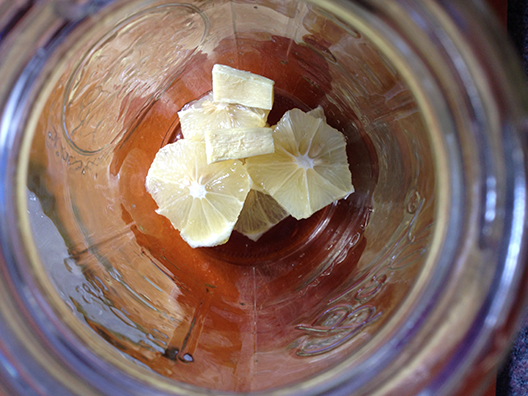 Recipe for a 32 oz Ball jar : 1/2 a rindless lemon + 1” of skinless ginger. Use your knife to cut the rind off half a lemon and also the skin off an inch of ginger root. 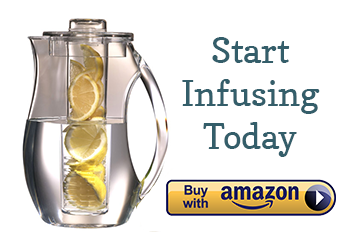 Because ginger is naturally pungent when raw, this infused water tastes better without the added tartness of the lemon rind. Add purified water and chill for 4 hours or overnight in the fridge. Are you using a raw ginger or those preserved ginger? Raw ginger always. Preserved ginger (like the kind at Japanese restaurants) is full of, as the name suggests, preservatives and contributes an artificial taste. what you say about additives in preserved ginger is rubbish – it’s just preserved in sugar & water, same as preserving any fruit or making home made jam, etc. It’s not rubbish. Amy is quite clearly referencing the unnaturally pink ginger used in commercial Kitchens, which is purchased in large quantities and is indeed doctored with artificial colour, sweeteners such as aspartame and chemical preservatives. I’m using a slice of fresh ginger root and a slice of lemon in hot water. It’s wonderful tasting and it detoxifies your liver. It also helps to get rid of inflammation in your body and helps keep you full longer resulting in weight loss. Yes it is raw ginger. I have also started adding Mint leaves for a milder taste. Using 2.5 inches of gingerroot raw, 3 lemons , 1/2 clove garlic. 3 limes 2 liter of spring water. Can you freeze the raw ginger just so it won’t ruin if you don’t use is all? OR does freezing ruin it anyway? Hey, Charlene. I actually have no idea! I have never tried to freeze ginger before. I will try it and get back to you. Thanks for the suggestion! I have froze ginger in the past and it was fine. Raw ginger can be frozen and it works well when you need the ginger grated for a future recipe. and grate it over food when I need it. Freezing it will spoil it almost over night. How would I go about using green tea instead of water. I think I would just make the tea first 32 ounces of water with 3 green tea bags then add the ginger and lemon after ? Hi, Roberta. You have two options for using tea. You can make your tea with hot water and let it cool to room temp or in the fridge, then remove the tea bags and add the lemon and ginger. Or, you can add all of the ingredients at once and let them steep for 4 hours or more. Infusing the tea bags for an extended period of time will release the same amount of flavor as if you had brewed the tea with hot water. Good luck! I really like the flavor of this infusion. I would like to drink it everyday. I know ginger is good for you. Problem is, I find my perspiration takes on funky odor for more than a week after drinking it. I read some place that ginger, as a cleansing agent, can cause a unpleasant perspiration odor, that is said to diminish. But I’m afraid to keep drinking it because I don’t like how I smell, afterwards. Are there any infusion ingredients that can cause a pleasant body odor? Maybe I could add that to the mix. Hi Amy I wish to know why is it given for 4 hours we need to freeze? Can’t it b done at a room temperature in case of absence of refrigerator? How many times can I refill this with water to infuse? Being South East Asian, we have access to various spices. You can do what my mother does. Buy the ginger, grate or blend into mash in a blender. Put into ice cube tray. Freeze. They work in soups, iced tea, orange and lemon juice. Even in asian salad dressing, if you got a bottle opening that will fit the cube. (Or use those long type ice tray.) We even slather on the ginger, blended garlic, sesame oil and lime juice as condiments to our Hainanese Chicken Rice. And great over and in fish stomachs when you are steaming. I prefer dunking ginger whole or slices into electric kettles aka thermos flask. Let it boil thru the night. Drink the concoction in the day for curing sore throats, coughs, flu, Laryngitis and the night, I use whatever remaining liquid, pour into a pail, and soak my feet. And boil a new batch for the next day. Its not recommended to be drinking ginger at night, as its up your metobolic rate, but a few heavy coughing fits I had no choice. I know that ginger is supposed to be really good for you but I just can’t handle the taste. It would be nice to try again though just to try and be healthy. Thanks for sharing. Aloha! If the taste is too strong, just go ahead and dilute it with water or ice cubes. It really mellows the taste and you still can easily drink it. Some ginger is better that no ginger. I have heartburn issues and since drinking ginger water, I have not had any. I throw ginger into a blender to break up in small pieces and freeze in small snack ziplocs. I leave on the gingerskins when I put in blender, since I’m not eating the pieces.When I want to make ginger tea, I put about 3 tablespoons of the ginger and pour 32 ounces of boiling water in the pitcher. If this tastes too concentrated I pour over ice and drink it or just add a little more water to my glass.Good luck! How much of it do you drink per day? If I make a large batch of it, how long will it keep in the refrigerator? I always grate my ginger with a zester so that you get all the goodness out. Helps when drinking the lovely lemony drink. I also use green tea with added lemon and ginger from time to time. It’s lovely hot or chilled overnight in the fridge. Sounds like a good idea with the rum. I thought that I was the only one that did that! I was wondering I made jug of lemon,ginger, cinnamon water I was wondering how many can I drink each day? Is it safe drink it all day or only morning and night to drunk it? Do I grate the ginger drop it in whole?? I have the same question?? Grate, chop, thin slice OR leave whole???? How long will filter water, raw ginger, lime and honey last in the fridge? I drink this most every day. I use about 3/4 pound of ginger to one complete lemon and a gallon of water. I love the taste of the ginger and it does do wonders for the body. A gallon lasts me about a week, I will refill what I take out for the first 2 days then continue the rest until it’s gone. I like a previous posters idea about grinding the ginger and freezing in, I think I’m going to try that next and just add a couple of cubes to water each day. Hi can drink overnight ginger water ? I have been drinking it all day. I make a gallon of it. I use 4 ginger cubes, 3-4 lemons, 2-3 lime, 1/2 cucumber and mint leaves. I let it sit overnight in the refrigerator. Then I drink it. When I get low, I add more water. I’m on NY second refill and I can tell I need to change the solution because all I’m tasting is ginger. I also noticed it wasn’t working. But yes, I drink Atleast 4-5 glasses the most. But it works great with my stomach bloat and if I really keep to 1 carb a day then I started losing a pound a day. But when the ingredients do not stay good, you will see your stomach bloated again…I always check in the morning. But I have Immobility of the Intestines so my bowels are not like everyone else. I have a question. What do you mean by cubes? Could you give an approximate dimension? Or, # of ounces? Thanks so much! I have the same question as Jamal, I left some ginger n water in a tea pot for some days, does it go off? Is it safe or should I re do it? Good news is it is a simple check. Just give it the old visual, smell, and taste test (similar to what you would do to check milk to see if it is bad). Because of the high PH level, fresh juice only lasts 24-48hrs. Can you use ginger powder or does it have to be raw ginger will you still get the Benefits of it and if yes how much. Can i store ginger water in fridge and how long ? Is this something that could be used as a liver recovery aid or preventative measure by using as mixer when drinking alcohol? The general consensus for infused water stored in the fridge is 3 days. But this can vary depending on how cold your fridge is, how fresh and/or perishable the infused items are, how often you are refilling the container, etc. Be careful and check the water regular because while certain herbs may last longer than 3 days (like thyme), certain fruits (like strawberries) may only last 1-2 days. The good news though is that it is a simple check. Just give it the old sight, smell, and taste test (similar to what you would do to check milk to see if it is bad) and if you notice anything funky or off, toss it…of course, you shouldn’t taste it if you see or smell any funkiness before hand. How often do you drink this? In the morning, before bed? I’m researching natural remedies so I can come off my meds in the future. I have started making ginger root tea with lemon. After boiling the roots have found that there is still a lot of flavour left in them Can I store these in the fridge? Can I leave them it in the boiled water in the fridge to make a stronger drink? Ginger tea is having many medicinal benefits. Thanks for sharing this information. It is very useful. I drink this almost every day. I love the taste of the ginger and it does do wonders for the body. Thanks for this amazing article. After making gingerroot water ….can it sit at room temperature for a week instead of putting it in the refrigerator? I want to make a large batch but do not have room in my refrigerator?